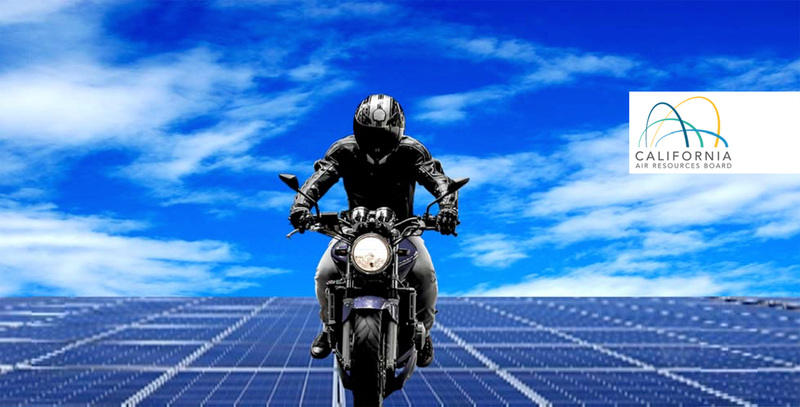 The purpose of the workshop is to discuss how motorcycles impact California’s air quality, and to lay out potential strategies that may be employed to achieve needed emission reductions from motorcycles. Staff will also present technical and regulatory advancements that have occurred globally in the motorcycle sector, and discuss how those advancements might be applied in California. The meeting was as much about collecting feedback from “stakeholders” as it was about presenting CARB’s plans, which meant there were riders on hand to grumble about regulation at every opportunity for questions. I attended virtually, since El Monte is in Southern California and CityBike’s official policy is to avoid SoCal if possible. The slides from the meeting, containing supporting data and other information as well as some sweet graphics, are available for your viewing pleasure at the end of this article. Motorcyclists, being (or at least claiming to be) rugged individualists or whatever personal branding we adopt, don’t take kindly to regulation, AKA being told what to do. If you’ve ever hung around a “motorcycle rights advocate,” you’ve probably gotten an earful of likely-fear-based, often-poorly informed yakkity-yak on how goddamned harmonization will result in us all being forced to ride quiet, wimpy motorcycles, wearing state-mandated high-viz vests. “It’s all about control,” you know. We here at CityBike are certainly not fans of The Man telling us what to do, but the reality is that vehicle regulation isn’t going away. I’ve said it before: it makes sense for riders to get involved where we can, in hopes of influencing intelligent, sensible regulation—like we did with AB 51—rather than complaining bitterly in 2024 (when the new standards are likely to take effect) about how The Man keeps giving us the shaft. Further, while California looks to Euro 4 (and the upcoming Euro 5) standard for inspiration, the Golden State often leads the way in the US—and sometimes the world—meaning that the motorcyclist equivalent of “I’m moving to Canada,” escaping the ever-overreaching regulatory hand of The Man by packing up your smoky two-strokes and moving to a “free state,” may not be a feasible solution forever. This slide from the meeting makes it abundantly clear why new rulemaking for on-road motorcycles is in the works, in addition to the fact that the last amendments to CARB motorcycle standards happened in 1998, and took effect in 2007 and 2008. California motorcycle emissions slide from CARB ONMC workshop. The first chart on the right shows emissions from cars and bikes. The green line—cars—has continued to come down, thanks to reduced emissions. Cars, or “light vehicles” as they were referred to in the meeting, have been the subject of much regulation and improvement (along with heavy trucks) while motorcycles have been mostly ignored, thanks to our relatively small numbers. The second chart shows the percentage of emissions contributions by cars and bikes. Since auto emissions continue to improve while emissions from bikes basically stay the same, bikes comprise a bigger and bigger percentage, and therefore become a target for further improvements in overall emissions. The high-viz arrow highlights the point, less than 20 years in the future, when motorcycle emissions hypothetically get close to the same percentage of emissions from cars, despite the much lower number of bikes on the road in California. The deck contains comparisons of current CARB standards to Euro 4 and 5. It’s important to understand that many production motorcycles already meet these standards, or are close, and obviously, electric motorcycles play a role here as well—and are covered in the deck. It’s also worth noting that harmonization doesn’t have to be a dirty word, in the right context. Manufacturers are already making Euro 4-compliant bikes, and working toward Euro 5. If CARB simply harmonizes with Euro standards, rather than creating separate, different standards, it’s less difficult for manufacturers—and therefore less expensive for us. CARB expects to kick off with Technical Working Groups in May of this year, consisting of motorcycle and parts / accessories makers, regulators, standards organizations, emissions testing groups, dealer and maintenance groups, and rider groups. That last one is “our” voice. And here’s the entire presentation from the meeting. Note: a friendly Reddit user pointed out that the link for the Euro 5 technical feasibility and cost effectiveness study on slide 12 doesn’t work. If you’re interested in checking out all 615 pages of that document, this looks to be the right link. There is another meeting coming up on May 18th, this one to “discuss proposed regulatory amendments for Red Sticker off-highway recreational vehicles (OHRV). You can read the official announcement PDF here. If you’d like to be informed of other such meetings and other CARB matters, you can subscribe to CARB’s email updates, sign up for our Dispatch email newsletter—or stay tuned here, of course. In the meantime, take a peek at the deck and tell us what you think in the comments.